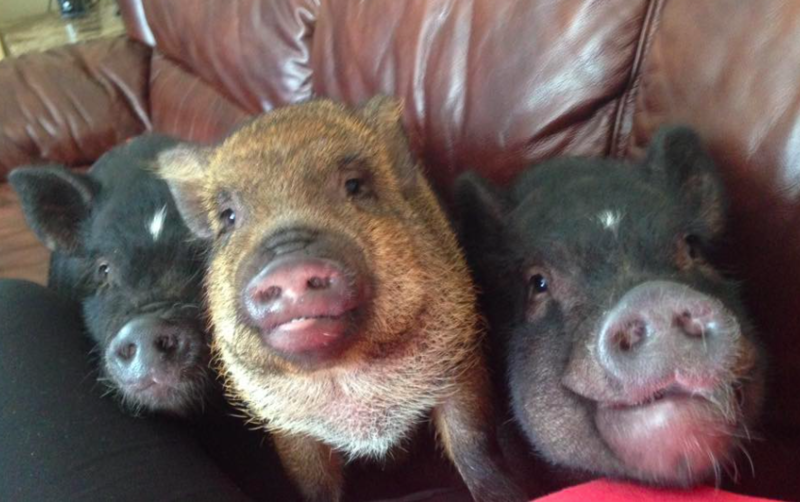 Multiple pigs- why did I decide to get more than one?? You made a decision to get more than one pig, odds are, you are questioning your decision at some point during the time when you have 2 or more pigs, especially if they live in the house. I have found the most common question is...Will they EVER quit fighting? One of the most common situations is when your pig leaves to go to the vet or have a procedure and returns with the "animal hospital smell" and not his/her usual scent. This can be interpreted as a new pig by the one left at home. The scent isn't the usual piggy friend, so this must be a new pig...time to show them who is the boss. How can you limit the amount of fighting when one returns? Here's some advice given when a pig left to be spayed. The younger pig started attacking when the older gal returned from the procedure. This is quite common. Your old gal was probably sedate and also smelled differently. The younger ones are making their move to be "top pig". Keep her separated until she is completely back to normal. Then there will be some fuss until she re-establishes herself as top pig. In the future, one week before vet trip, put small amount of vanilla extract on everybody's head daily. Before sedate pig comes home, put some on traveling pig to confuse sense of smell. Keep traveling pig separated for 48 hours while putting vanilla on daily for another week. ​Pigs are herd animals so for that very reason alone one can extrapolate that pigs living together is the most natural and thus, the most satisfying situation. Some say a lonely pig is the saddest thing on earth. Dogs typically have other dogs to keep them company, at the very least, they can likely hear a bark from a neighboring dog and because they speak the same "language", they can chat back and forth. Cats don't care if they have any kitty friends, as far as they're concerned, they are the rulers of the house anyways. However, pigs are social animals and like to have company. We all say, a bored pig can be a destructive pig, so providing a friend can sometimes curb behavioral issues like boredom that can lead to more serious issues like aggression. Even if you dont have house pigs, you can still have multiple pigs (as long as your zoning allows it) and even multiple pens if they aren't very fond of each other, They can still "talk" to one another even through fencing. Some have pens that are various in size and configuration ranging from 32 feet by 20 feet for the smallest pen with 32 feet by 40 feet being the norm. In all these groups, there is a definite pecking order. One of the pigs will still take the leader role while the others will fall into the follower roles. There is ONE boss and when you have more than one pig, they can be the boss of each other instead of trying to be the boss of the human family. Some others opinions on having 2 versus a single pig home. I do think that with children involved two would be a better option than one. There are people who have had problems with children and pigs. I believe that the children came after the pig was grown and the pig was defending its family, as he saw it. With two pigs the chances of that aggression rearing its head is almost totally reduced. My sister has a seven month old baby and he loves the pigs to death. My sister and I have a brother/sister pig pair, Boggie and Garbo. Two pigs in my opinion are better than one in any case. If you get them at the same time then you will avoid fighting to establish dominance. The pair will still want and need your love and attention. They will do their "piggy" things with each other and won’t try to treat you as if you are a pig. Toby and Tito come when called, sit, circle and lay on command. They aren’t having any problems going down or coming up the ramp to their yard. In fact, they mostly do all of their business outside and just play and tear up the paper in their litter box. Anyway, the litter box will be a thing of the past soon. Their personalities are so different. Toby is coming out of his shell. His most favorite thing in the whole world to do is ROOT. He roots in the grass, he roots in blankets, he roots on Tito, he roots on ME! It’s really funny. Toby falls down on his side when you barely touch him and lays there indefinitely as long as someone is touching him. Tito is much friskier. He is the first to go up and down the ramp. He heads up all investigations. Tito is in to ramming Toby and aggravating him. He wears the harness well and lets us lead him a little better than Toby. He is very talkative and gets really miffed easily. We are so glad we made the decision to adopt our brother piglets — they are such pals. I have more than 1 pig who live in the house and each pig has a best friend. Each pig came into the house one at a time, and after the initial scuffles, they became friends with the established pigs. Bacon was first into the house, and when Porkchop came to live with us, Bacon was furious. It seemed as if Bacon wanted to kill Porkchop. But after a few days, the scuffles ended and the friendship began. 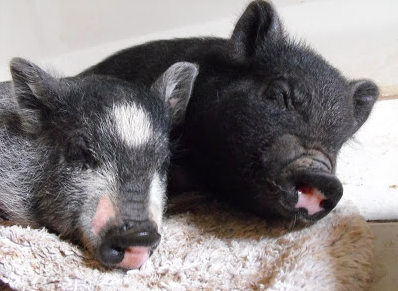 Now Bacon and Porkchop are very good friends; they play together and they sleep together. Bacon’s friendship with Porkchop never affected his relationship with me — Bacon is still my friend. It became obvious that even though Bacon and I were friends, and even though we lived with other animals (dogs and cats), Bacon was especially happy to have a pig friend. This was confirmed as we got more pigs and these pigs would pair up: Hambone with Zoro, Hoover with Top Hog, and Hamlet with Hamburger. Pigs like pigs and I think it’s best to have two of each type animal just like in nature. The hard part to believe is that, in the long run, a second pig takes up no more space and no more work than one. It’s no harder to take two scoops of food, or cut one carrot into two pieces, or set two bowls on the floor instead of one. Two pigs keep each other company and occupied. With a second pig, they become more interested in training, are more stable and well adjusted. Most importantly, they get more time to act like pigs. My baby was...well is spoiled. Two weeks ago Saturday I adopted another female that needed a loving home and yes they had tiffs for about three days but not the are best of friends. Attached to each others hips. It actually gives me a break because they entertain each other and my baby is not focused on me toy play with her all day. I mean yes they both require my attention but not as much as before. I say adopt another...about the say age. I would not do a baby. We do recommend that introductions of a new pig to the family be done with caution. This is covered on the next page, properly introducing pigs to each other. Some pigs develop behavioral issues over time and getting a second pig doesn't correct the bad behavior you have allowed to continue. This will need to be addressed by retraining your pig and this can be done effectively and you can teach your pig manners and respect. (Click here to learn about behavioral modification plans, continue hitting the next page button at the bottom of each page to continue on to the next topic regarding behavioral issues and tips on how to correct it). Pigs belong to relatively stable social hierarchies, which play an important role in self-regulating behavior and maintaining group harmony. Believe it or not, pigs will teach each other manners and respect too. Sources: Members of We love potbelly pigs FB group, Members of Mini pig health management FB group and Followers of Mini Pig Info on FB.